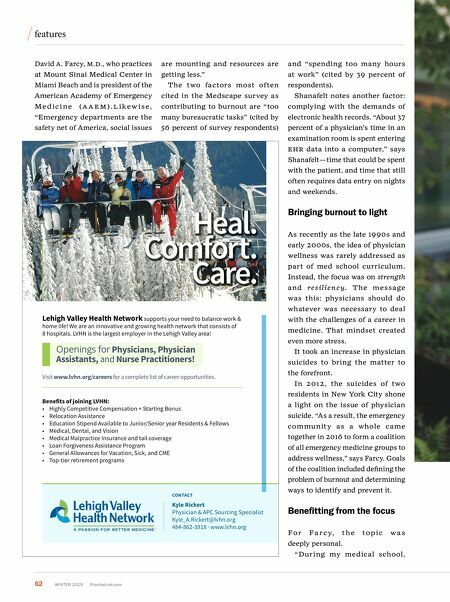 PracticeLink.com W INTER 2019 63 the Q uality of life issue emergency medicine and critical care fellowship training, physician burnout and wellness was never addressed," he says. "We were taught to just press on." B ut wh i le i n residenc y at M a i mon ides Me d ica l Center in Brooklyn, Farcy was a first responder on 9/11 — an experience with memories that he put "in a box" and didn't speak about to others. Then, during a moment of silence paying tribute on the one-year anniversary, Farcy's experiences hit him hard. Farcy's program director took notice and invited him to her office to talk. She suggested he get help and referred him to a representative from the ACGM e . From there, he visited a psychologist trained in PTSD and survivor guilt— and got the help he credits with changing his life. "I am grateful that my institution had a program in place and a plan to address the issue without fear of repercussion," Farcy says. Antonia P. Francis, a maternal feta l med ici ne fel low at N Y u Langone Health Center, reports that while she hasn't personally known any physicians who have committed suicide, "I trained at an institution that experienced two suicides of house staff within a three-week period, yet I can honestly say that during my medical training, the topic of suicide was not heavily stressed." Francis, who works a fairly typical 80-hour a week, says, "I experienced The first step to getting help with burnout? Acknowledging there's a problem, says a ntonia f rancis, M.D. See this issue's physicians in exclusive video interviews at Facebook.com/PracticeLink. 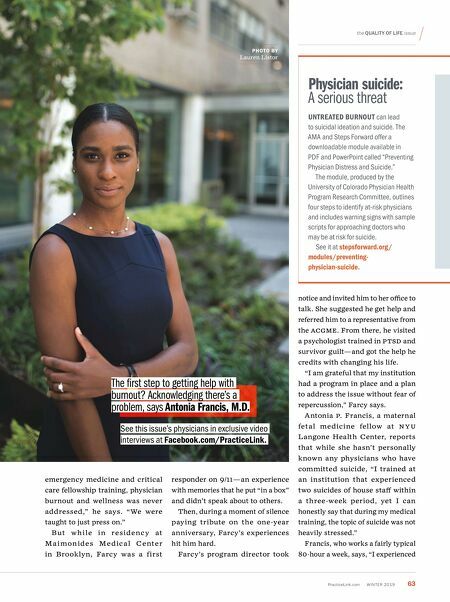 PHOTO BY Lauren Listor Physician suicide: A serious threat UNTRE ATED BURNOUT can lead to suicidal ideation and suicide. The AMA and Steps f orward offer a downloadable module available in PD f and PowerPoint called "Preventing Physician Distress and Suicide." The module, produced by the u niversity of Colorado Physician Health Program Research Committee, outlines four steps to identify at-risk physicians and includes warning signs with sample scripts for approaching doctors who may be at risk for suicide. See it at stepsforward.org/ modules/preventing- physician-suicide.